Wigan chairman Dave Whelan has been charged by the Football Association over comments he made about Jewish and Chinese people in an interview. 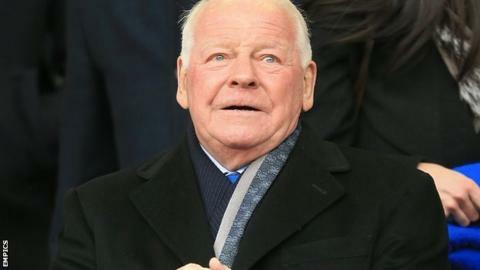 Whelan, 77, has apologised for the comments and has until 18:00 GMT on 5 December to respond to the FA charge. It is alleged his original statements were "abusive and/or insulting and/or constitute improper conduct and/or bring the game into disrepute". Whelan has also insisted that he was misquoted in the newspaper interview. He has previously said he will resign from his position at the Latics if the FA punishes him for the controversy. Whelan made the comments to The Guardian while defending his decision to appoint Malky Mackay as Wigan manager, who is still being investigated by the FA over claims the Scot sent texts of a homophobic, racist and sexist nature while in charge at Cardiff. The charge includes an alleged "aggravated breach" of FA Rule E3  as Whelan's comments included "a reference to ethnic origin and/or race and/or nationality and/or religion or belief". Whelan, who played for Blackburn and Crewe during his career, became chairman of Wigan Athletic in February 1995, with the side in the third tier of English football. Ten years later they won promotion to the Premier League for the first time and spent eight years there before winning the FA Cup in 2013 - the first major trophy in their history. But they were also relegated in 2012-13, lost in the Championship play-offs last season and have struggled in 2014-15. In November, Whelan sacked Uwe Rosler and replaced him with Mackay despite the Scot being under investigation by the FA. Whelan, criticised for that decision, then agreed to an interview with The Guardian, in which he reportedly suggested Mackay's messages - alleged to include a derogatory reference to Jewish football agent Phil Smith - were not particularly offensive. The newspaper claimed Whelan said "Jewish people chase money more than everybody else", and that he also defended Mackay's use of the term "chink" to describe a Chinese person.